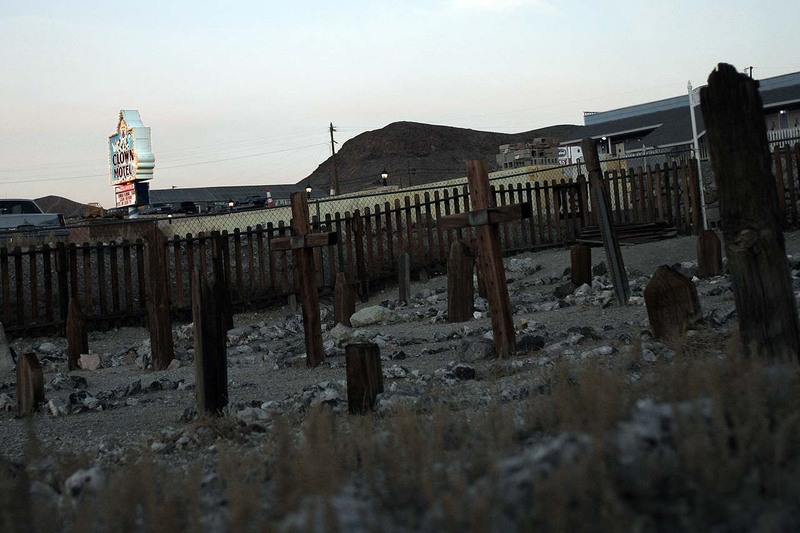 This Nevada Motel Has Been Named America’s Creepiest Motel - Dare To Visit? This Nevada Motel Has Been Named America’s Creepiest Motel – Dare To Visit? 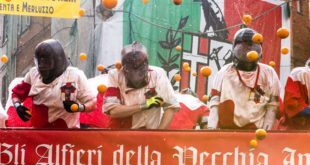 If you are someone who is in search of constant thrills, then this is the perfect place for you. 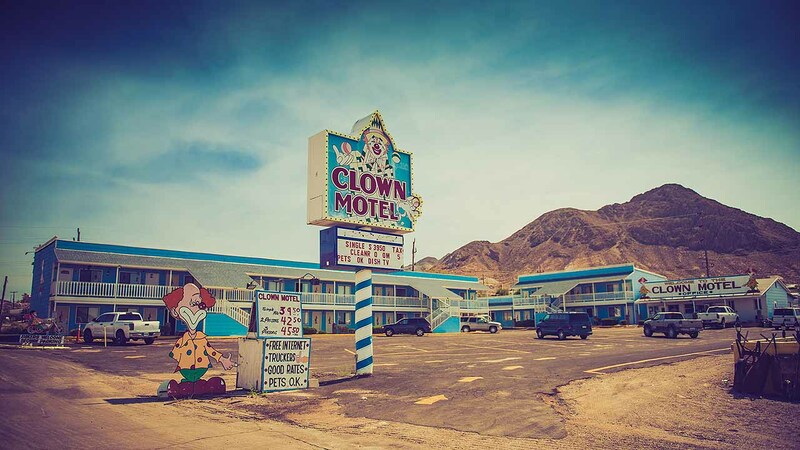 The Clown Motel, located in Tonopah, Nevada, will not only bring you the thrills, but it also comes with a package of chills. It sounds like a scary setup or story by Stephen King but the Clown Motel is far from that. 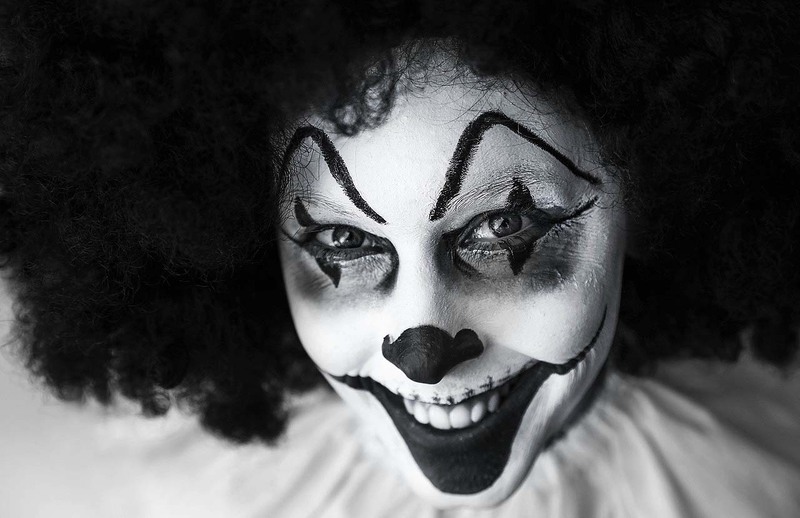 The Clown Motel is the ultimate nightmare for those who suffer from coulrophobia – the fear of clowns. Located on the edge of the desert and decorated with thousands of clowns, the motel is conveniently positioned next to an abandoned graveyard. 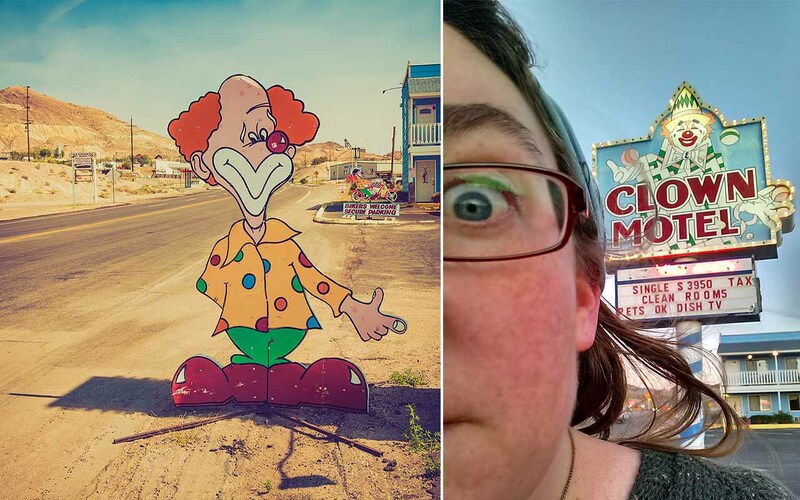 At a first glance, Nevada’s Clown Motel may seem like the product of a horror writer’s fevered imagination. As guests approach this one-of-a-kind motel, they are welcomed by an illuminated grinning, juggling clown that promises “clean single rooms for $39.50”. The sign itself is enough to give you a hint of a warning as to what you can expect if you continue your journey towards the motel. Most of the guests who stay at the inn are bikers, truckers and other long-haul drivers who wish to snooze off for a couple of hours. 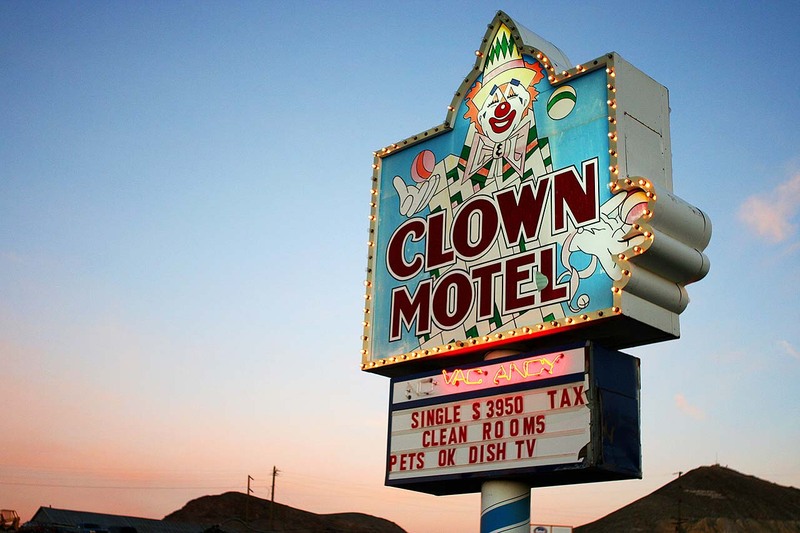 For those who suffer from coulrophobia, this isn’t the best place to spend the night. 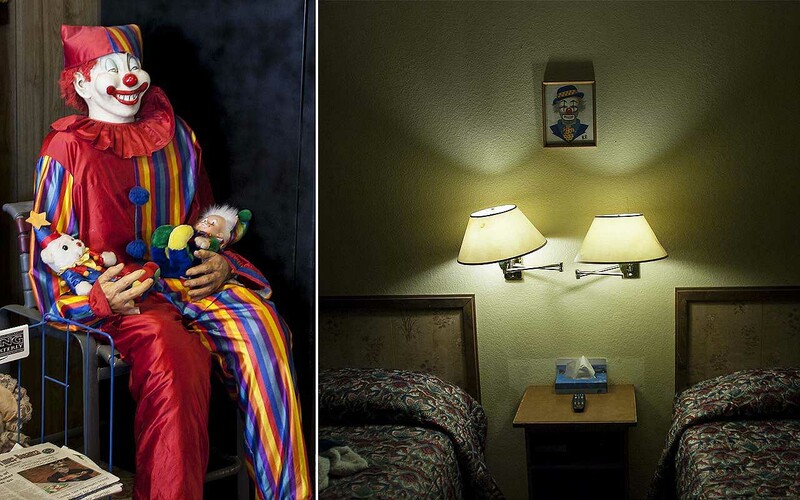 If coulrophobics don’t turn around at the sight of the illuminating, grinning, juggling clown, then the motel’s inside would surely do the trick. The lobby is filled with life-sized clowns sitting, standing and clustered together with smaller clowns. The entire motel is clown-themed, which means that there are clowns stacked almost everywhere. The front-office has a shelf portraying some of the most famous and creepiest clowns you can imagine. The rooms are all clown-themed so no matter where you turn, all you see is something that will remind you of your nightmares. Imagine waking up in the middle of the night and the first thing you see is the portrait of a clown staring back at you! Just the thought is enough for me. If the inn itself is not scary enough for you, then maybe the location of this creepy motel will make you just a little more uncomfortable. Tonopah is a former mining town in Nevada that had a population of more than 50,000 residents at one point. The location was once rich with silver and people from all over the United States moved in to thrive on the riches. 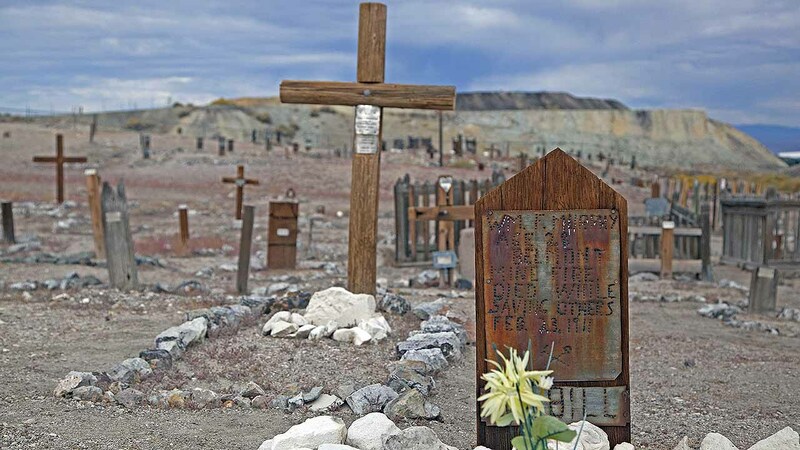 Today, the Old Tonopah Cemetery that was founded in 1901, is filled with miners who lost their lives from mining accidents. 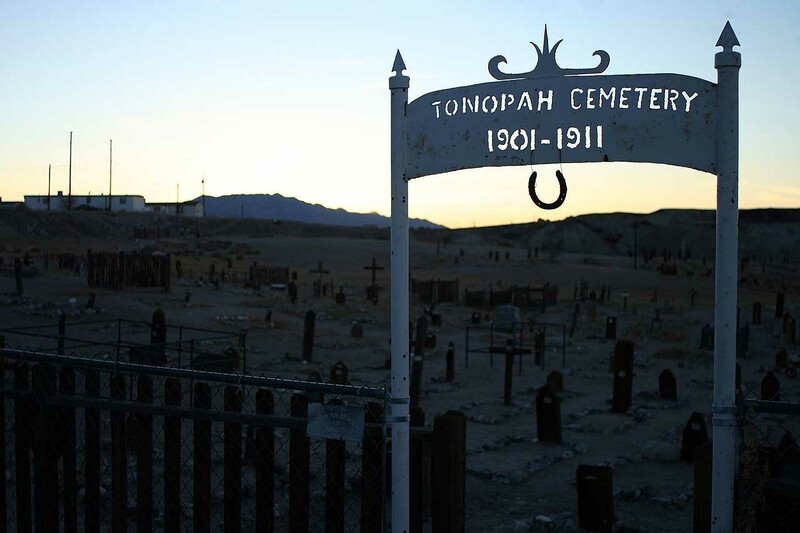 The Tonopah cemetery is also filled with bodies of people who died from a mysterious plague in 1902. During the richest silver strike in the history of Nevada, more than 50,000 residents lived in this town. Today, this ghost town is home to less than 2,500 people. Most of the cemetery is filled with wooden crosses and the names engraved on tin signs. The gravesite is located right next to the Clown Motel. In fact, if you are brave enough to stay at the creepy motel, then you might just be lucky enough to have a bedroom with a window facing the cemetery. The picture above doesn’t do justice for the creep-o-meter, so here’s a better view. Several guests who were brave enough to stay at this motel have reported strange sightings and happenings during their period of stay. While authorities and experts are yet to discover any evidence suggesting that the place or the surrounding is haunted, they believe that the case is nothing more than mass hysteria. 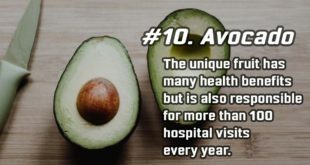 Although, the creepy stories and incidents reported by guests have made a positive impact on the business. Ghost hunters and enthusiasts frequent the motel in search of spirits, as well as to get a kick out of the eerie place. Several men and women have documented their stay at the motel so the world can hop in and feel the experience. Although there are no ghosts or horror stories that are real, the motel is still dubbed as “America’s scariest motel”. The real question is: Are you brave enough to spend a night here? 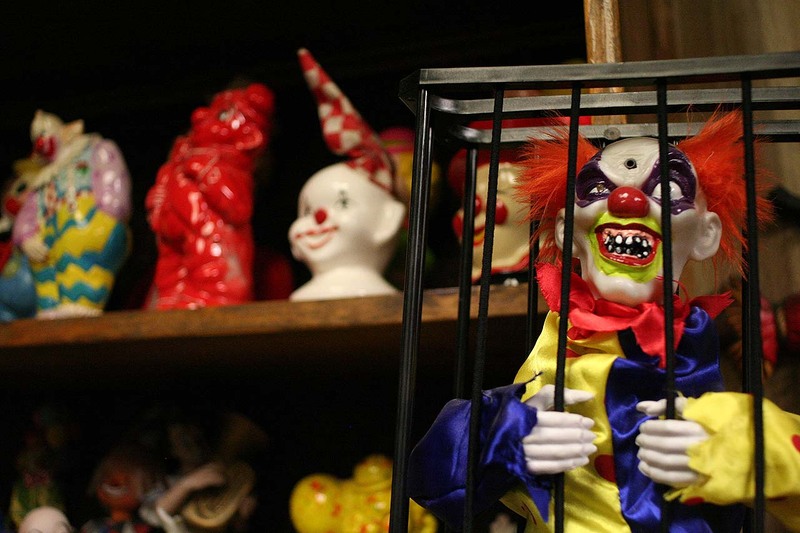 Let us know what you think about America’s scariest motel (The Clown Motel). 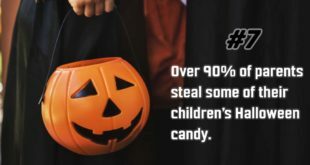 Don’t forget to share this creepy story with your friends!